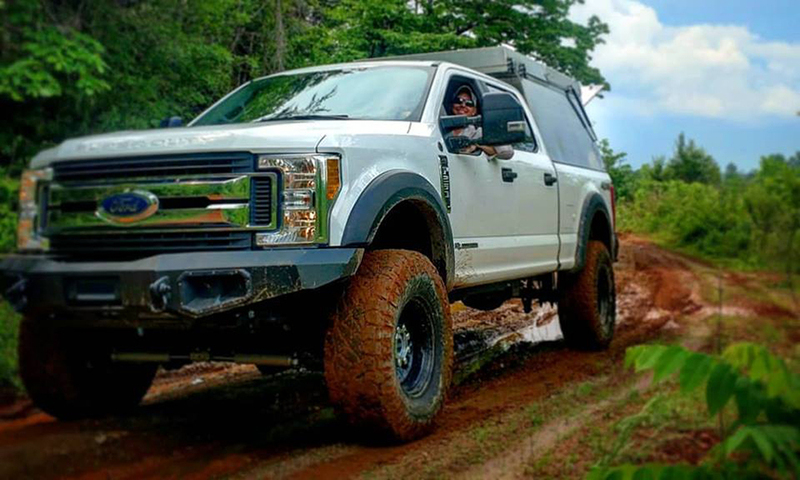 Greg Scott spends a lot of time in the mountains, and owns this awesome overland-upgraded Ford F250 STX with a 6.7L Power Stroke. It’s topped with an AT Overland Habitat truck camper which makes it a monster combo for family camping getaways. Greg’s AT Habitat truck topper – essentially a hybrid between a camper shell and a slide-in camper, weighs only 340 lbs. If you haven’t yet seen one in person, they look really cool and have a low profile. The truck camper is made from aircraft-quality aluminum, insulated composite panels and stainless steel hardware. Greg’s AT Habitat has a machined aluminum finish, but AT Overland also offers vehicle color matching finishes. The roof is actually a cantilever bed and tent that folds open, which supports 600 lbs. For all seasons, it’s not your average tent, being made exclusively for the AT Habitat by Nemo Equipment. The bed is quite comfortable, with a dense foam mattress. When folded out, there’s 7 feet of headroom when standing in the truck bed. 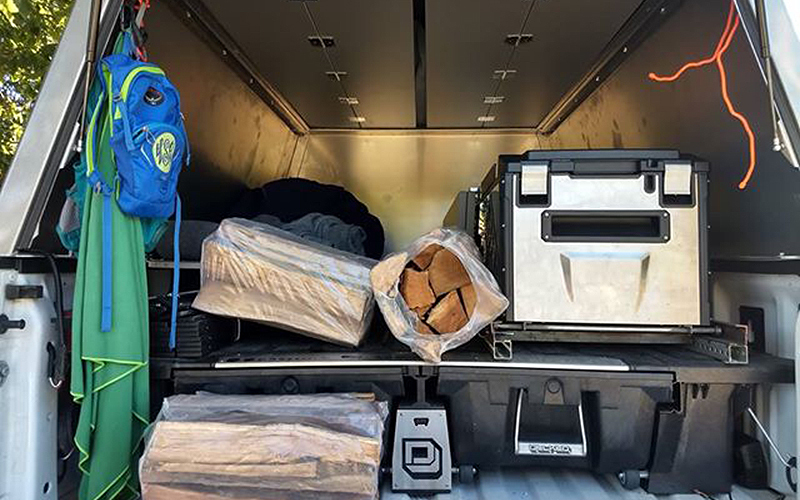 For Greg’s setup, he also incorporated DECKED truck bed storage which features large slide out drawers in the rear, while giving you a flat deck on top to walk or store gear on. In this case it’s the floor of Greg’s AT Habitat camper. 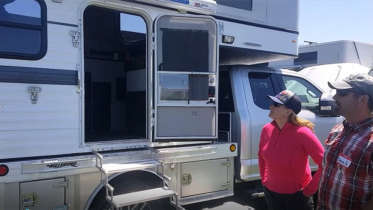 Other features include a custom built aluminum storage box for the electrical system and on-board water, as well as an ARB elements 63 quart fridge on a slider. According to Greg, his F250 has “Gobbs of power in the mountains, fully loaded it never flinches with approx. 525hp & 1100ft/lbs of torque.” Greg achieved the horsepower/torque boost, through a K&N air filter, EGR program adjustments, an EZ Lynk tuner that’s cloud-based, and a 5” straight exhaust pipe. Despite the performance upgrades, Greg’s F250 maintains 15-18 mpg. 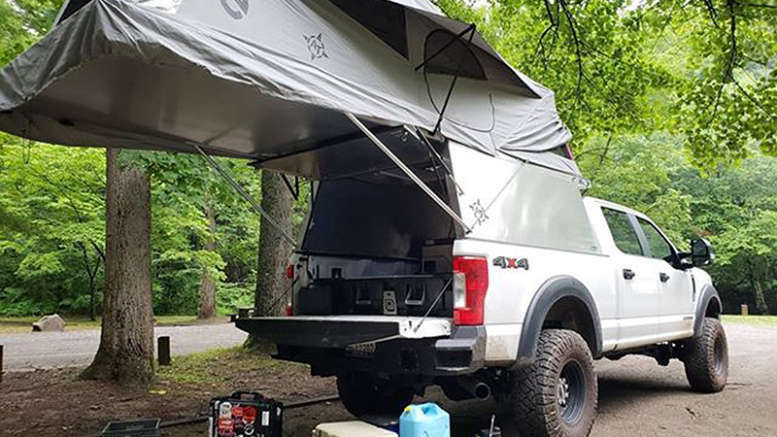 Greg’s overland Ford F250 & AT Habitat camper combo certainly makes for a great rig to get away in the mountains, and we think his rig ranks as a Savage Camper! 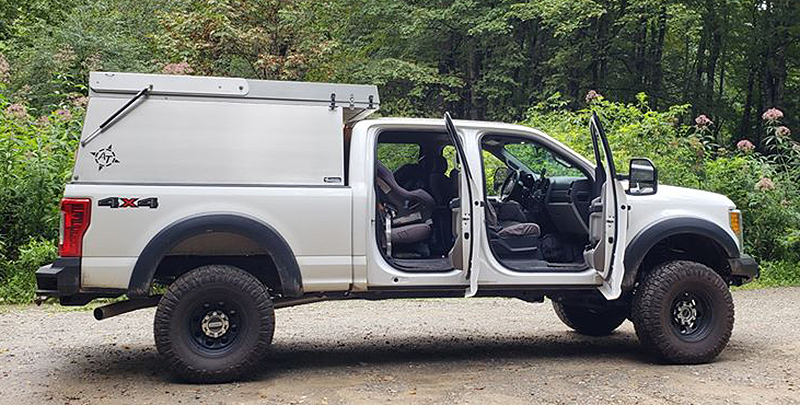 Be the first to comment on "Overland Upgraded Ford F250 STX Paired with an AT Habitat Truck Camper"